It's Official: Electoral Votes Are Counted; Obama & Biden Won : The Two-Way At a joint session of Congress, the Electoral College votes from each state were read aloud. Update at 1:30 p.m. 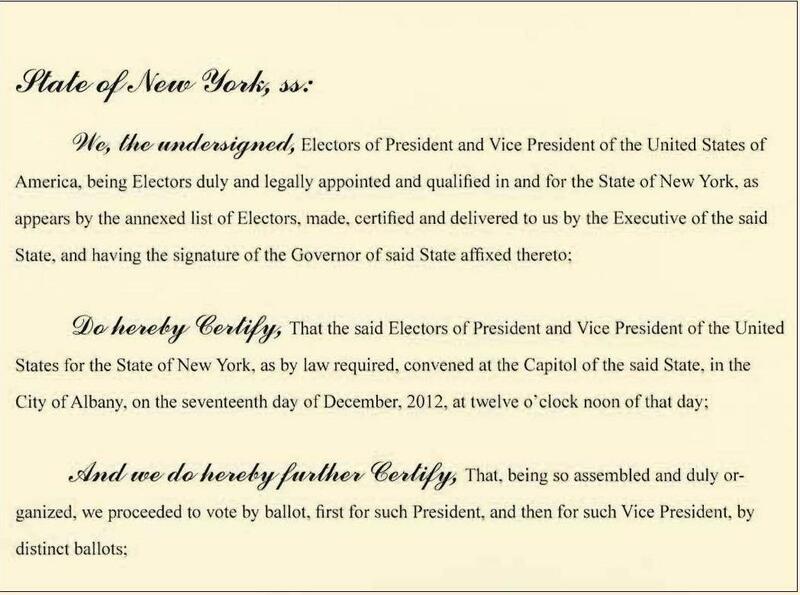 ET: The counting is done and as expected, President Obama and Vice President Biden collected all 332 Electoral College votes they earned on Election Day. Their Republican opponents, Mitt Romney and running mate Rep. Paul Ryan of Wisconsin, received 206 votes each. Since it takes 270 Electoral College votes to be elected, the president and vice president have indeed been returned to office. Next: Taking the oaths of office. They'll do it twice. Because Jan. 20 falls on a Sunday this year, there will be private ceremonies that day. Then on Jan. 21, there will be the public swearing-in outside the Capitol (weather permitting). 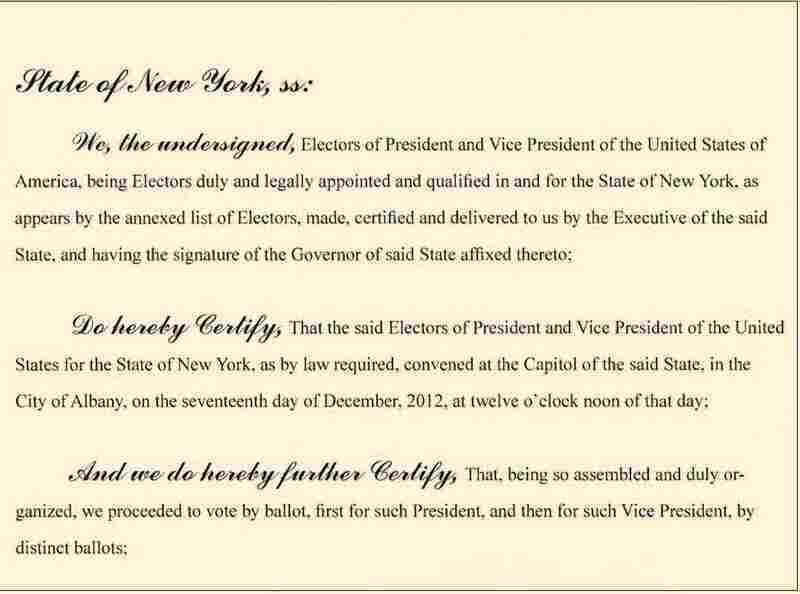 An image of New York's Electoral College certificate. President Obama and Vice President Biden are about to be declared winners of the 2012 election. Electoral College votes are now being counted at a joint session of Congress. If you wish to watch, C-SPAN is webcasting here. We'll update with the official word when the count is finished. If all votes are cast as expected, there should be 332 for the president and Biden, and 206 for Republican presidential nominee Mitt Romney and his running mate, Rep. Paul Ryan. It takes 270 Electoral College votes to be elected.